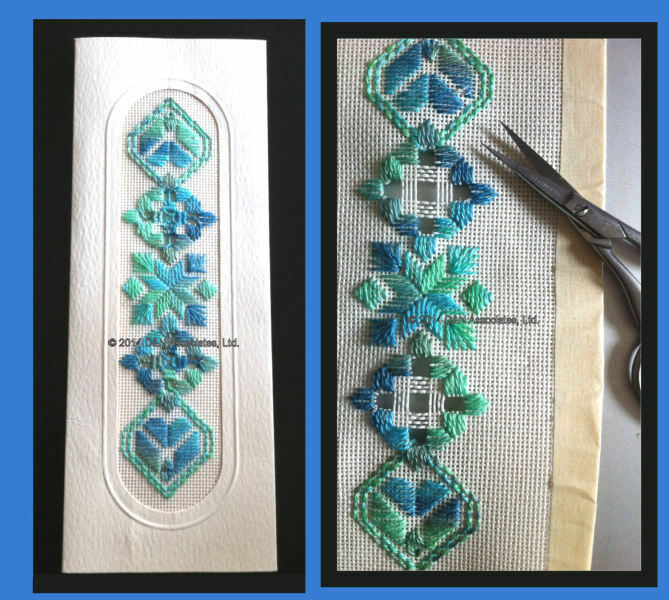 I like stitching pieces for cards, you can send them away with a nice note to a friend or use as they are in a window card as your stitched piece is already framed, ready to sit about a room to offer a spot of color. This ivory color rectangular card is sized at 2.75 by 7.25 inches, with a 1.3 x 5.75 inch opening. I had considered purchasing this size card from Nordic Needle several times, just wasn’t sure if I could come up with an interesting design for the stitching area. Then in April, Nordic Needle offered the card, envelop, and design by Roz Watnemo as their free pronto gift with $30 purchase. All it required to have on hand was size 8 thread, 24 count congress fabric and a needle (don’t we all have plenty of those on hand!). I used Caron Wildflowers 207 Bermuda Reef thread. I quite enjoyed Ms. Watnemo’s design, it was an easy design to follow. I included the photo on the left for those who have not done cut work before and are thinking about giving it a try. You need a really good, sharp, precise scissor else it is more like you hack then snip the threads. My favorite cut work scissors are both Ginghans and I only use them to snip out threads for my cut work areas because I want those pointed ends extremely sharp. The scissor that I show in this photo, if opened and you look closely at the end points they slightly cross over one and another. It took me some time and a few wrongly snipped out threads to learn these scissors, but now they are my favorite for precise thread snipping. Word of caution, have your finger too close to the thread you want snip and these sharp scissors will put a slice across your fingertips (remember to move that finger quickly because you don’t want any blood on your finished piece 🙂 ). While I was stitching I put masking tape on the edge of the 24 congress fabric as the edge thread easily unravelled.